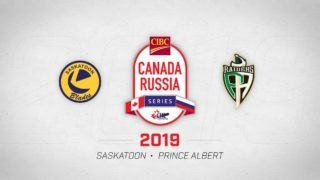 Saskatoon, SK – The first encounter between the Saskatoon Blades and the Regina Pats post-trade deadline was earmarked to be a test for both teams. 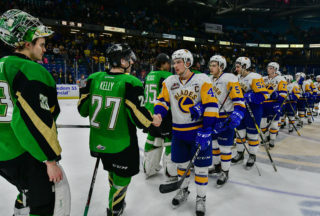 For the Memorial Cup host Regina, a win would have been an affirmation that they’re deserving of their place in the post-season. For Saskatoon, a win would mean another step in the right direction for their young team. 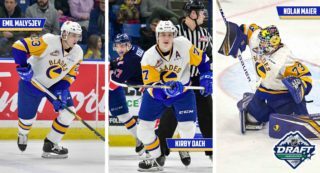 It was the young Saskatoon squad who sent their message. Led by their rookie sensation in net, Nolan Maier, and one of the newest Blades’ delivered from out west, Eric Florchuk, the Bridge City Bunch withstood a Regina Pat comeback and an onslaught of shots faced to take a signature 4-3 overtime win against a divisional rival. The Blades jumped out to a 2-0 lead in the first period. Striking first was Florchuk, whose pressure against the Pats on the left wing spilled the puck out of their possession, giving himself a breakaway opportunity. Florchuk sped away with the puck and unable to be caught, deked in on Regina’s tendie and scored unassisted. Later, Josh Paterson, Braylon Shmyr and Chase Wouters linked up with a passing play that opened up the Pats’ defence, allowing Wouters to finish the play with a goal into a wide open net. The Blades’ lead had doubled. However, the Pats responded before the period was over as Jesse Gabrielle sniped in his 5th of the season to halve the score. The teams went into the first intermission with the score set at 2-1 Saskatoon though Regina were leading in the shot department 19 to 12. Surely spurred on during the intermission, the Pats came out of the break with something to prove, scoring again to tie up the game 2-2 through former Blade Cameron Hebig. The Pats added another late in the period to take the lead when Sam Steel banged home the puck amidst the chaos of falling and battling players in front of Nolan Maier. In addition to taking the 3-2 lead, the Pats continued to outshoot the Blades 15 to 9 to round out their dominance in the second period. Momentum swung back to the Blades in the final 20 minutes of regulation as Saskatoon continued to create chances against Regina until a Big Time Goal from The Captain, Evan Fiala, tied the game back up. Receiving the puck at the point from Michael Farren, Fiala crept in to close the distance between him and the net before slotting in his 5th goal of the season through traffic. Randen Schmidt, his defensive partner, also collected an assist on the play. From there, the scores remained locked at 3-3 as the teams buckled up for overtime. The Blades controlled possession for the majority of the extra-time period, featuring the ever-spacious 3 on 3 hockey format. For Saskatoon, their control and patience paid off. Collecting a loose puck from a previous chance, Florchuk dished the biscuit off to Kirby Dach on the blue line at right wing. Florchuk then drove hard to the net where Dach beautifully sauced it back to Florchuk who redirected it in for the game winning goal. Nolan Maier was ever-steady in net for the Blades, fighting off 45 of the 48 shots he faced for the night, earning him first star honours. 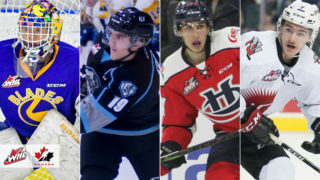 Florchuk, having scored the game’s opening goal and the game-winner, collected the second star while Saskatoon local Cam Hebig was awarded the third star with a goal and an assist. 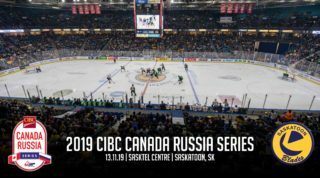 The Blades will have little chance to celebrate their magical victory against the Regina Pats as they face off against another Eastern Conference foe immediately on Sunday Night as the Moose Jaw Warriors are in town for Welcome the World Night.